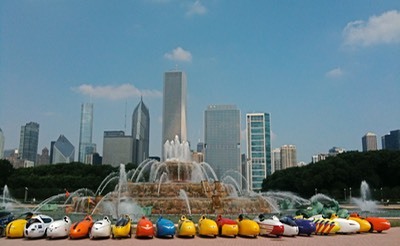 In 2011, the first long distance velomobile group ride took 36 riders from Europe and the US all the way across North America, from Portland, Oregon, to Washington, D.C.
in only four weeks we covered almost 5.500 km, from the Pacific Mountains across the grasslands and into the Midwest, along the Great Lakes and over the Allegheny mountains to Virginia, rolling through the pittoresque streets of D.C.'s Georgetown exactly 28 days after leaving Portland. ROAM 2011 was a big success and a great experience for everyone involved. Search for it on YouTube and you will find plenty of footage, check the discussion boards in English and German. The Captain's diary is available for free on iTunes or as PDF download. 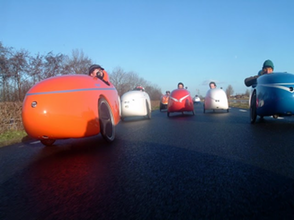 Riding a velomobile is truly special, and does not easily compare with any other mode of human power transportation. However, it shares the same benefits and values with other means of cycling. Millions of cyclists and tons of studies have confirmed that cycling to work, for recreation and exercise, for touring and traveling as well as for those everyday trips around home is healthy and fun, a rewarding exercise and an effective diet. At the same time, cycling is emission free – an easy entry into helping the environment and controlling climate change. Cycling is known to be a key contributor to liveable cities, reducing the congestion of the urban environment with pollution and noise. Biking across cities puts riders in direct touch with their environment and its social and safety issues. Read more about this on the Velo-City pages of the European Cyclists' Federation. Essentially, a velomobile is a three wheeled recumbent bike inside a aerodynamic shell. They have demonstrated their potential, durability and versatility over millions of miles on European roads and trails. Cycling is said to be the most efficient mode of human power transportation. Velomobiles are the most efficient mode of cycling. Here are the GPS readings of one of the riders on the Roll Over America Tour (ROAM) for each of the days – a good illustrations of what these machines are capable of. •	with a high visibility on the road as well as in public because of their unique appearance. Velomobiles are designed for commuting over longer distances. Most velomobile riders use their machines every day, to ride to work, to run errands or for other daily mobility needs. They are rare and raise a lot of attention, in particular as a group. Thus, velomobiles are perfect catalysts for a dialogue on sustainable mobility.